The increasing value that consumers place on their electronic devices has heightened awareness of those devices’ reliability. It has also spurred a greater emphasis on, and demand for, protecting these electronics against possible damage from environmental factors. This demand, in turn, is driving unprecedented growth and breadth in the use of conformal coatings. More types of applications are moving to the use of coatings, and more coatings are being used within a given application segment. For example, more types of smartphones now use coatings. Conformal coatings are designed to electrically insulate circuit boards, and isolate their components from damage caused by debris and water. The protection they provide helps prevent conductor corrosion, dendritic growth, and electrical crosstalk. Ultimately, that protection can prevent the device failures that may result from such damage. How much salt water exposure can your electronic devices withstand? Those who recently lived through a hurricane have been finding out the answer to that question. Unprotected copper traces, wires, and components do not get along very well with salt water. Corroded electronics are not especially welcome in a weather emergency, nor in our everyday work and life. Yet, reliability may never be considered strongly enough until it’s really needed, or when it’s missed. Although modern electronic devices and components can withstand a lot of abuse, they are not indestructible. Great effort is taken in their design and manufacture to provide suitable durability. However, full testing of durability can typically occur only after a design or build qualification process is already well underway. It’s not uncommon that, at the final hour during durability testing, problems may be revealed that require unexpected and unplanned strategies to protect electronics from the environment. The changes that must then result from these new requirements must be made to work around existing designs and manufacturing processes that are already in place, while also minimizing any cost increases. But they often end up being more expensive, and likely less effective, than if such protection had been factored into the design of a device right from the start. Environmental protection strategies often involve trade-offs among performance, perceived value, and cost. Added circuitry and component protection can enhance customer satisfaction and the value of a device, but they may not always justify a higher price to the purchaser. Although many different materials have been used in the past for conformal coatings, three main types dominate for use with electronics. These are acrylics, urethanes, and silicones. Each has its own advantages and limitations. Acrylics (sometimes abbreviated as “AR”) are often inexpensive and easy to apply. They provide a hard, tough coating that is relatively easy to repair. However, they have a narrow useful temperature range and are typically supplied in the form of solvents. Some of these solvents can pose handling, safety, and environmental challenges. Acrylics generally do not have a cure mechanism; instead, solvent evaporation dries the film. Polyurethanes (sometimes abbreviated as “PU”) overcome some of the limitations of acrylics by being usable over a much wider range of temperatures. Though typically not as hard, polyurethanes tend to be tough, and they add relatively low stress to sensitive solder joints and wire bonds on a circuit board. These advantages come with their own trade-offs. Polyurethanes are more difficult to use, since circuit boards often must first be dried before they are applied. There are also toxicity concerns with some urethane formulations, which must be carefully addressed before they can be used. Silicones (sometimes abbreviated as “SR”) have the widest usable temperature range and are very easy to handle. Most of them are solventless and add very little stress. However, these superior properties do come at a cost, which is typically a higher price per kilogram. Yet, several factors are influencing engineers to choose silicone conformal coatings over other options to provide greater reliability and durability to electronic devices. These factors are low stress, lower production costs, tin whisker issues associated with lead-free solder, high-temperature processing issues associated with lead-free solder, higher reliability, and faster processing. Electronics are shrinking in size even as they expand in functionality. This results in boards with higher component density, narrower spacing, shrinking lead sizes, and smaller-gauge wires. All of these — board, components, and wires — are more sensitive to movement caused by the mismatch in thermal expansion of different board, component, and wire materials. A coating must protect without over-stressing a board’s solder joints and wire bonds. Soft conformal coatings with a very low modulus are sometimes the only effective protection that does not cause damage during thermal movement, mechanical shock, or harsh vibration. Silicones are well-known and recognized as providing great environmental protection coupled with low modulus and high elongation. These features of silicone conformal coatings, in turn, deliver low stress to the boards and components over which they are applied. Thorough analysis of the total cost of ownership has proven to electronic device suppliers that silicones often provide the lowest cost-coating solution. Manufacturers are finding that lower-priced coatings do not necessarily yield lower total production costs. There are several reasons for this finding. The handling of flammable, odorous, or even toxic solvents can become very costly once volumes rise. High-volume production lines demand materials that are very easy to handle and use, cure quickly, and provide minimal environmental impact before, during, and after use. The need to dry parts before they are coated or other special handling procedures adds cost, as do slowed cycle times or higher reject rates. Emerging initiatives and regulations have forced device manufacturers to find alternative materials that are qualified as containing either a minimum amount of lead or no lead at all. Lead-free solder alloys meet the new requirements, but come with their own issues. Many new alloys contain tin, and with it comes the rising concern of tin whiskers that can bridge between components to cause electrical arcs and shorts. Silicone conformal coatings can delay and slow the formation of tin whiskers. Tin whiskers typically grow in straight lines out from the metal source. The shortest distance to bridge will always be a straight line. Since silicone coatings cause whisker growth to bend and curve, they can deflect the whiskers’ typical growth direction to lessen potential arcing and shorts. The higher temperatures required for lead-free soldering can cause process residues to leach out from board or component substrates. This can make it difficult for organic materials in a coating to obtain good adhesion to those substrates, but that adhesion is a primary mandate for ensuring that the coating provides good moisture protection. Silicone conformal coatings have exceptionally good surface wetting characteristics that allow them to cover and penetrate microscopic crevices and spread under components. This quality also enables them to lift and isolate any surface contamination. Silicone coatings also have much higher thermal stability than acrylics or polyurethanes. This is especially important when multiple coating and soldering process steps are required. It’s also important when rework must be done that may require multiple passes through very high temperature, lead-free solder reflow ovens. 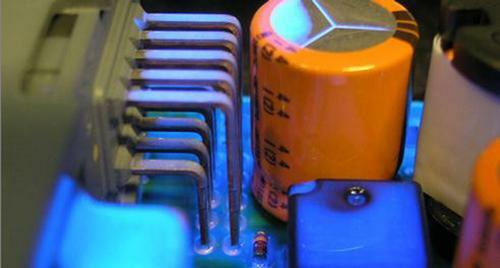 Conformal coatings often can provide an increased level of protection to electronic circuit boards and components. Silicone coatings typically offer superior stability when they are exposed to most harsh environmental conditions. These include heat, high humidity, vibration, mechanical shock, and moisture. One limiting factor for production line throughput speed can be the time required to cure a conformal coating. In particular, when applying solvent-based coatings enough time must be allowed for the solvent to evaporate. 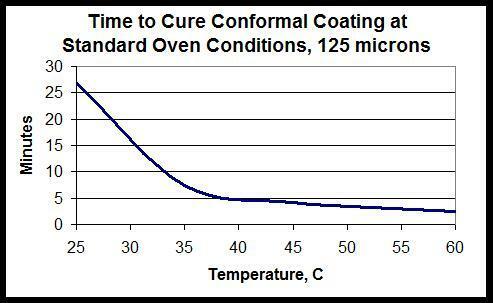 The cure times of solvent-free silicone coatings can be accelerated with the application of mild heat. These coatings can therefore cure extremely quickly in conventional ovens without the need for added humidity. Infrared ovens can potentially achieve even faster results. In some cases, cure times of less than 60 seconds — and even cure times of less than 30 seconds — have been achieved by the application of such mild heat. Fast cure times such as these begin to encroach upon ultraviolet (UV) cure speeds without the issues that often accompany such products. 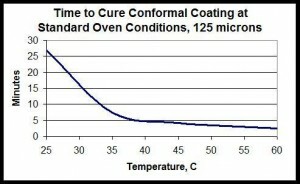 Coating cure times have in some cases been the cycle time rate-limiting step, or bottleneck, in the production process. For some production lines, using a much faster curing coating that reduces cure times to a few minutes can eliminate this bottleneck and produce cost savings. In summary, the proven performance of silicone conformal coatings shows that they are particularly effective in protecting today’s electronic devices. Most of these coatings are very soft with a low durometer value, which minimizes thermal expansion and contraction stress. 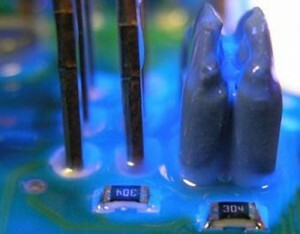 Silicone conformal coatings are commonly used in both very high-volume and low-volume manufacturing lines. While they are higher priced than most other conformal coatings, their total cost of ownership may in fact be lower. This is especially true when engineers are using newer, solvent-free, and very quick curing formulations. Studies have shown that silicone conformal coatings provide some of the best results with regard to preventing device failures caused by the formation of tin whiskers and related phenomena associated with lead-free solders. Combined with very high environmental stability, silicones can typically offer enhanced device reliability and durability.